In order to understand what to look for in foods for diabetic pets, understanding the basic mechanism of diabetes can ensure a wise choice. The relationship between the hormone insulin, blood sugar levels, and food is where it all begins. When a pet has diabetes, their cells no longer properly respond to insulin. Insulin helps cells absorb sugar from the blood which then fuels various biological processes. When The cells no longer respond to insulin, as is what occurs with diabetes, excess blood sugar builds up leading to the various health problems associated with diabetes. The pancreas has to work harder to produce more and more insulin which can cause organ failure over time. This cycle can be corrected with proper diet and pet activity levels. When it comes to looking for high-quality food for your diabetic pet, there are a few points you can look for when shopping around for a great brand. Your vet will have a small list of options for you that can cut down on your research time. However, if you want to know what the foundation of a great diet is, here is what to look for and what to avoid. Low Carbohydrate – Consuming high levels of carb-rich food can cause an immediate spike in blood sugar levels in your diabetic pet. This causes stress on the pancreas as the body tries to produce more insulin – the opposite of what you want to achieve. High Protein – Cats and dogs thrive on diets with high levels of animal protein. When your pet gets most of its caloric intake from a high-protein food source they do not get blood sugar spikes. Rather than grains and seeds, opt for organ meats, fleshy meats, cartilage, sweet potato, peas, and other complex carbs. Portion Sizes – When your pet is overweight, the excess fat cells trigger a hormone that reduces insulin uptake even more. This causes more complications in a diabetic pet. Ensuring your pet is eating proper portion sizes for their size and activity level plays an important role in diabetes management. Feeding Schedule & Treats – Making sure your pet is eating based on a regular schedule can help to make sure they get into a routine. 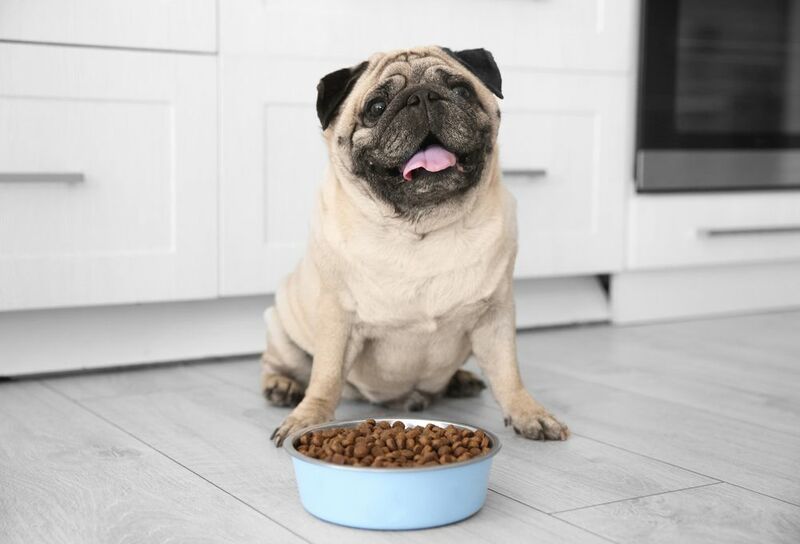 A consistent feeding routine at least twice daily about 12-hours apart can help to make sure your pet’s internal digestion processes are working correctly. High protein treats, like dehydrated meats, are great top-ups that provide nutrition between meals. Make sure to avoid anything made in China as well as all semi-moist commercial treats. The former is linked with kidney failure (in dried poultry products), and the latter is full of unhealthy sugars and fillers. A Willing Participant – Your pet needs to be a willing participant in the eating process. If they do not like the food you provide and are not eating well, this can have an impact on their health as well. There are a lot of very tasty foods available that meet the criteria required for a diabetic pet. Activity Level – Although not directly related to food, activity level plays a key role in how much food is offered. If your pet is very low activity, less food is required. A more active pet, or a pet ramping up activity levels, may require more food to accommodate. Keep an eye on weight over a couple of months to determine an optimized amount for your pet. There is no one-size-fits-all approach to what food brand to feed your diabetic pet. However, if you follow the general guidelines above, with the help of your veterinarian, you will be sure to find a great solution that works for you and your pet. If your pet requires insulin injections, the kind of food you choose can call for more or less depending on how your pet metabolizes the food. In the beginning, make sure to closely monitor blood sugar levels and adjust your situation accordingly. Remember to always work closely with your vet when making changes to your diabetic pet’s diet, insulin shots, or other suggested needs. Reach out today and ask them about the options that are best for you and your companion. Adopting alternative food for diabetic pets is a great way to make sure your pet is getting the best care possible. It is one of a few key factors is a well-managed diabetic pet. Contact our Lake Mary, FL office for further information.